This review of the Samsung PN60F5300 is a bittersweet milestone for me. It represents the end of an illustrious era of plasma TVs. Over the last couple of years, one by one, major TV manufacturers have halted their plasma TV production lines in favor of making LED backlit LCD TVs. I doubt we will see even one new 2015 model of this revered display technology. The King is dead! I will lament the passing. For years, LED TVs have strained in vain to match the deep blacks and rich colors of a great plasma screen. But TV technology marches on and with the advent OLED TVs, the crown has been passed. Long live the King! Before we lay to rest plasmas, let's take a look at one last brave warrior. The Samsung PN60F5300 is a fitting example of why I admired these displays. Unlike the Samsung PN60F8500 plasma Smart TV, that I reviewed, with this F5300 series, Samsung has pared away all the fancy features and Smart TV apps. What remains is an easy to use, no-nonsense TV with gorgeous picture quality. If you don't need or desire an Internet connected Smart TV, then take a long hard look at the F5300 series. 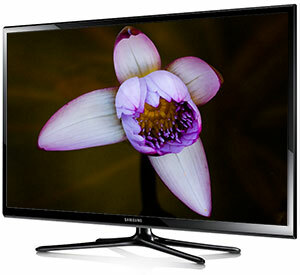 On their website, Samsung has cut the price of the 60-inch PN60F5300 almost in half, down to $800. With this combination of price and picture quality, the PN60F5300 earns our Highly Recommended rating. The Samsung PN60F5300 picture quality is mouthwatering. The sound from the integrated pair of 10W speakers can't compare. Please, at the very least, pair this plasma with a sound bar and subwoofer. Since this F5300 series is not a Smart TV, there's no built-in Wi-Fi and no apps connecting to streaming content providers. No 3D playback, no integrated video camera, no voice recognition nor motion control. Just a lovely plasma display. But the lack of fancy features is a plus because this TV is easy-peasy to use. As much as I like this 60-inch TV, at the MSRP of $1550, I wouldn't call it a bargain. But at the current online price of $799, its value should be irresistible to those videophiles who have been lusting for a plasma TV. It could be your last chance before Elvis leaves the building.